It's time for the second of four Guest Designer spots for the fabulous challenge blog Just Us Girls! 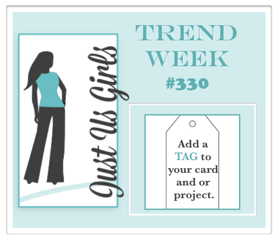 This week is Trend Week and the theme is ADD A TAG. 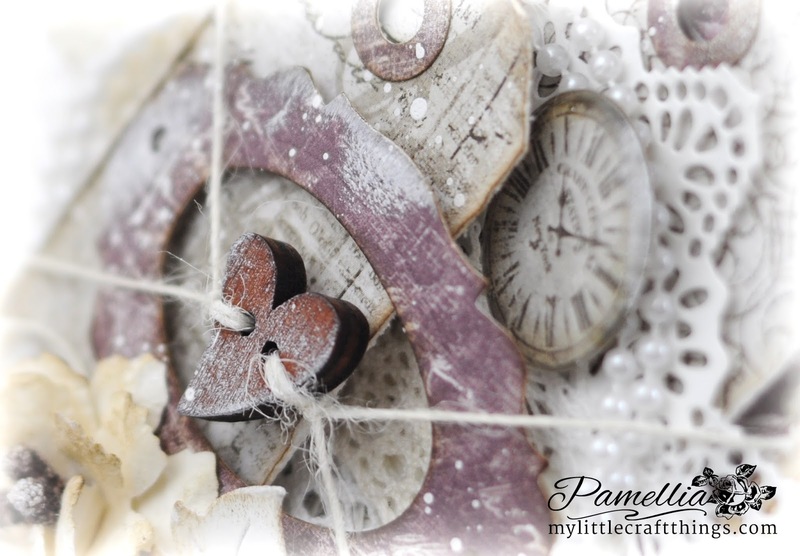 I decided to squeeze one last Valentine's project in and do a shabby chic romantic tag with a darker tone. The papers I used are all from Maja Design. I used the Vintage Autumn Basics and Vintage Spring Basics. The doily die is Prima Crochet Doily, the leaves are Cheery Lynn Flourish 14, the frame is from the Sizzix Tag and Bookplate die set, the tags were cut using Sizzix Thinlets Tag Collection and the flowers were cut using the Sizzix Large Floral punch. The pearl strands, the stunning flower stamens, the beautiful wooden heart in the center and the gorgeous laces were all sent to me by a very lovely and sweet friend SILJE KRISTIN of Mitt Lille Papirverksted. Kristin is one heck of an inspiration, you should take a minute and visit her blog so you can see her amazing talent! Kristin is a member of the Maja Design team, so I thought this would be the perfect time to say thank you to her for the wonderful gift package she sent me. Thanks Kristin!! I distressed all of the edges of the panels and inked them up with Distress ink Gathered Twigs. The flowers were also coloured with Gathered Twigs. I dabbed a little white paint on everything for that little extra shabby appeal. Would you believe me if I said we got some snow? No, I don't blame you, I barely believe it myself! It's not a lot, but it at least it feels a bit more like winter around here, because I gotta tell you Miss Mother Nature, if you aren't going to give me my winter, then I demand you go straight to spring and give me back my leaves!! Big surprise, some more night photography shots. First up...this creepy looking spot at the top of the hill. Cemetery perhaps? I'm so checking this out when it's NOT prime zombie season! Practising with my zoom lens...getting a little better, but still needs work. I gotta say that working with this lens is a bit like trying to shave your legs with your TEETH! Awkward! Next up, THE GOLDEN TREE!! These shots have not been altered in any way, this is how this tree looked as I was walking along the path...a big Golden tree in the middle of all the darkness! I only have one thing to say about this next image...PARENTING FAIL!!! ...or my good friend Barry. They just keep coming, no matter the weather!! Bless their little hearts! 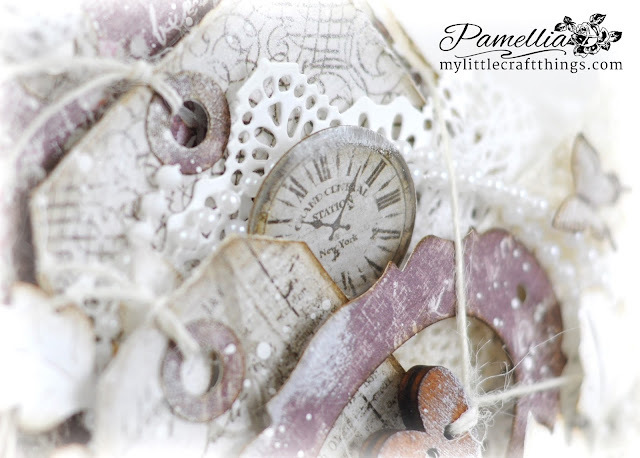 This is gorgeous Pamellia, the colour scheme is beautiful. I love the papers and the little butterflies too. Another treasure, Pamellia! I just swoon when I see those delicate layers! I love seeing those tiny butterflies and such a unique way to add the little wooden heart! What a wonderful group of gifts Silje sent you! Lucky girl! I'm enjoying your snow...how beautiful and Bob looks fabulous with his dusting! Thank you for sharing your beautiful photography with us. Big warm hugs! We're freezing here, but next week it's bikini season once again! The essence of a tag Pamellia! Love it! 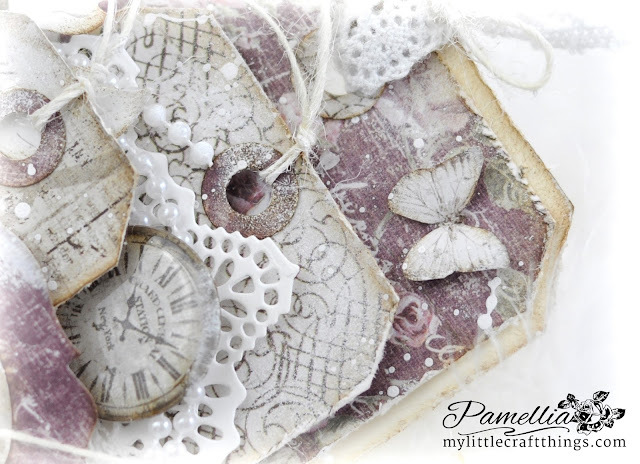 What a gorgeous tag Pamellia - love all the layers and textures, yet they all 'fit together' beautifully. Your squirrels are gorgeous - they obviously each have their own distinct 'personalities'! 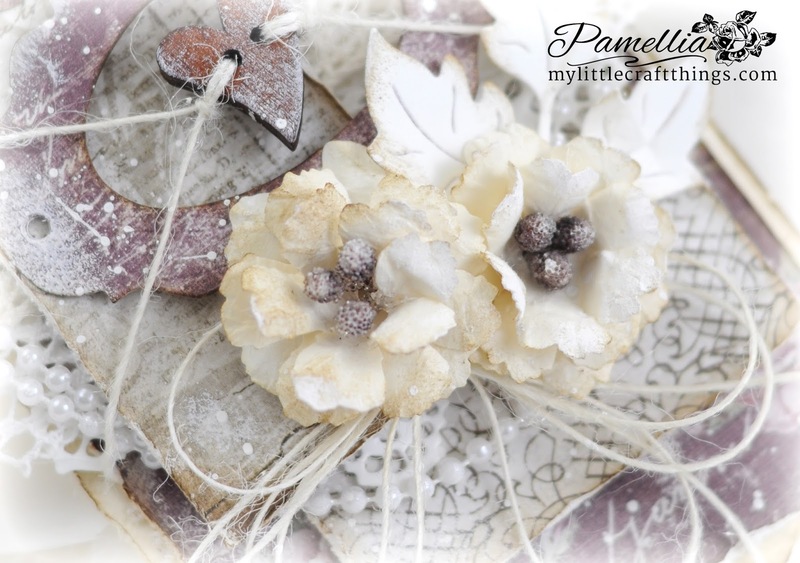 Wow, Pamellia, I love your style in creating of lots of layers so stunningly arranged! What a genius way to attach that awesome heart button! Glorious and delicate design with such a perfect touch of those mini butterflies! Brilliant tag! Thank you so much for your fabulous photos! It's raining here, in my part of the world and I miss snow! Thank you very much for the photo ... winter we have proteins have other color, a noctilucent. Beautiful tag lovely layers, butterflies , button and even pearls hidden in , just gorgeous. Loving your pics the first one, oh so spooky looking , but the one that gave me a good laugh was your quip " PARENTING FAIL " .... what a hoot you are Pamellia . Have a lovely Valentine weekend. Gorgous once again Pamellia. Love the layout and those yummy pinks, love the wooden heart and the way you have threaded the twine through. We always heave a treat with your creations. 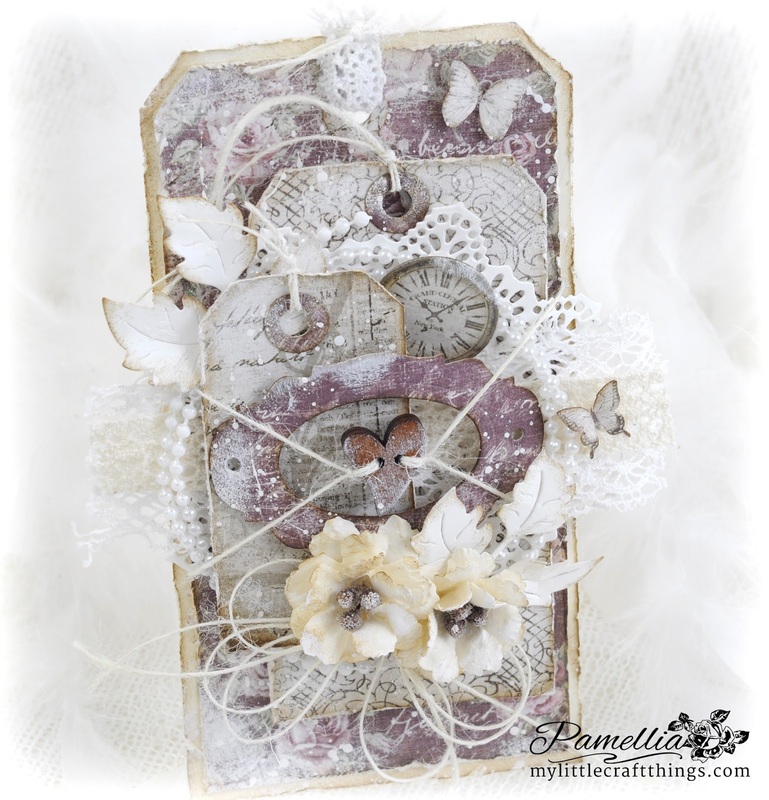 Stunning tag Pamellia, beautiful papers and colours, fabulous dimension and distressing, love how you've attached the heart button! That golden tree is just breathtaking! It's a stunning creation with all those soft layers and delicate twine ... Fabulous photos too! Lovely card. Your friend looks very cute and happy. A gorgeous tag. The darker colour theme is beautiful and your flowers are stunning. Sally.x. Stunning tag which brought a smile to my face..so very beautiful. Loved the photos too of your squirrel friend and that stunning golden tree. How special that he comes no matter the weather, sheer delight! An amazing tag, so many pretty items peeking out here and there, it's a discovery each time I look at it. I love the gorgeous muted colour too - who says Valentine has to be red anyway? think this is even more beautiful. Wow..Beautiful..loved the different color combo..and the way you have tied the tiny heart ! Wow that is a real gorgeous tag, you always add so mant beautiful layers. Super photos, the golden tree is awesome. Not just one tag but a whole plethora of them. Great project Pamellia, the wooden heart charm at the centre of your design is so striking and the butterflies and flowers are really pretty. As always with your gorgeous pieces there is lots of detail and textures for us to feast our eyes on. Beautiful! I love the colours and that heart button. Gorgeous tag Pamellia! I love all of the beautiful papers and your stunning details! Fab pictures too, the first one is so spooky! It's a tag on a tag on a tag....how FANTASTIC! I'm a sucker for tags. Beautiful creation, loving all of your pretty little elements. WOW!!! Thanks so much for playing along with us at The Mod Squad Challenge Donna, Challenge Host. 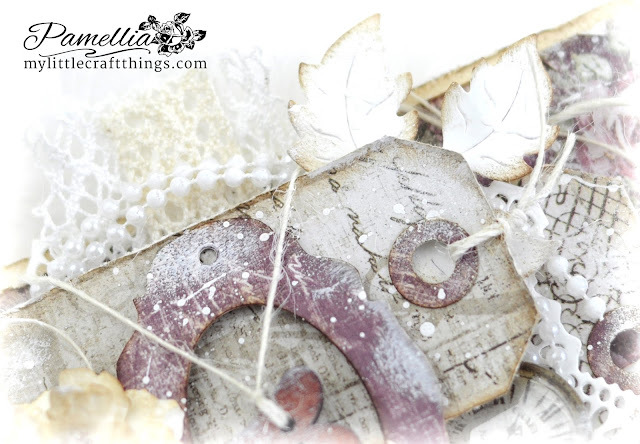 Your tag looks heaven sent Pamellia especially with the heart in the middle claiming centre stage. Beautiful tag Pamellia, love all the shabby layers. Great night time photos and those squirrels are so sweet. This tag is just amazing! Breathtaking and so very beautiful. O live the centeredheart. Gordegous layers and colors, and the chain is beautiful between the layers. Gorgeous layers in such wonderful vintage color!!! Love it! I love how the white adds such sophistication to this beauty, Pamellia! Layers upon layers of gorgeous goodness. Hugs!!! Ooooh!! This is oh so pretty! Love the vintage, shabby chic look! Loving all the layers, and all the detail you packed onto this amazing creation! Glad that you are guesting with us this month at Just Us Girls! Wow Pamellia, such a Chique beautiful tag with so many gorgeous details to drool over. Please make sure and link up to Cheery Lynn this week as the challenge is Tickled Pink. Such a beautiful tag. Amazing details on it. So pretty and feminine. 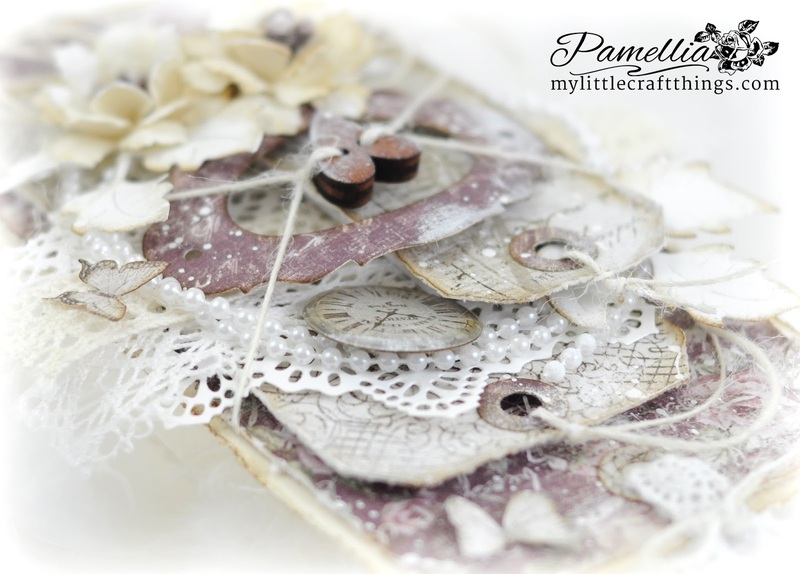 WOW this is one spectacular, stunningly designed tag Pamellia, the colours, layers and embellishments are outstanding. I laughed when I read your comment about the lens and shaving legs, lol, great photography, I really love seeing the squirrels they are wonderful and such fun. Oh my wow, Pamellia, this is spectacular!! Oh my gosh, I absolutely love, love this!! The layers are amazing!! I'm not kidding when I say it takes me so long to comment...I have to absorb every detail!! You are the shabby chic queen!! I love how you wrapped the heart with twine!! Stunning, stunning tag my friend!! LOVE!! Lovely layers and layers of Romantic goodness. You are amazing with layers. Have a wonderful Valentine's Day. Always enjoy your nature photos. Squirrels are always so busy ! We saw a pure white one while visiting Washington DC in the park. Gorgeous tag Pamellia, beautiful colours and layers, love this Tag!!!. The thing I noticed right away is how you tied the heart to the tag...very creative, and the string adds that extra bit of layering dimension. I'm always amazed at the things you come up with Pamellia. Well done! 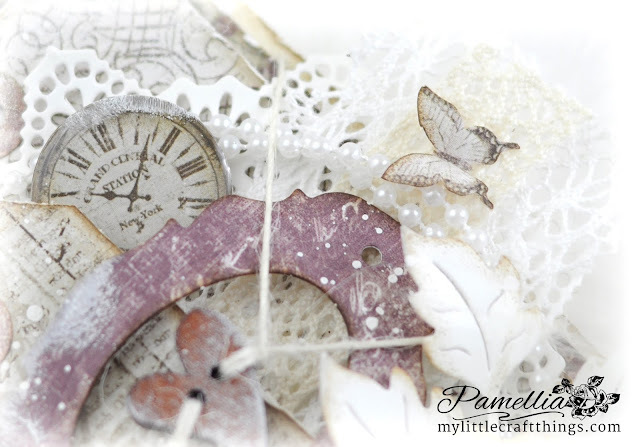 Absolutely love this, Pamellia - the vintage colour palette really appeals to me - so subtle and pretty. Gorgeous shabby chic work. And the nature photo gallery is wonderful as always. Be still my heart! I love, love this tag! Beautiful in every way. I'm glad you finally got a bit of snow. Seems almost the same here, although we did get a blizzard two weeks ago. OMG my jaw dropped when I saw all this amazing detail on the most beautiful shabby chic tag I have ever seen. So much to drool over so Thank You for all the steps you took to create this masterpiece. Love your photography too. I don't know how you are going to surprise us for next weeks Challenge at JUGS. So much talent and so happy you are our Guest this month. So pretty Pamellia! Love all the layers and pearls! Great mix of patterned papers! Wonderful photos too! Oh Pamellia, I think this is a new favourite! Love those darker, monochrome colours, love the idea of the twine through the heart also, altogether what you do with your twine is always so clever. The flowers (with their wonderful centres) are stunning too. Really, really love this!! The photos are amazing too, and your little friend is just adorable!! 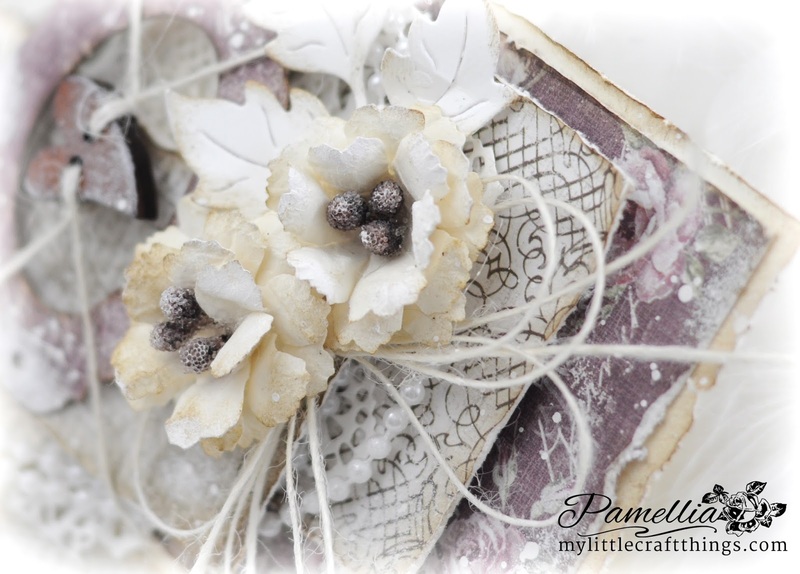 Lovely vintage card Pamellia! And your nature photos are beautiful! I love the last one of the squirrel with the snow on its nose! So cute! I am constantly in awe with your work, the details you put into your work is amazing. This is such a beautiful card from the frames, to the pearls to the wooden button etc etc. AWESOME work. You photos are awesome too. I did laugh about the close up lens being " working with this lens is a bit like trying to shave your legs with your TEETH!" you have to say when you tried that hahahahahaha. The squirrels are certainly giving you great shots too. Beautiful Tag !! love de colors en de details lovely ! WOW, what a ton of yumminess!!! This is one fabulous card, girl... love those Cheery Lynn leaves, your gorgeous flowers, and all the TH tags! 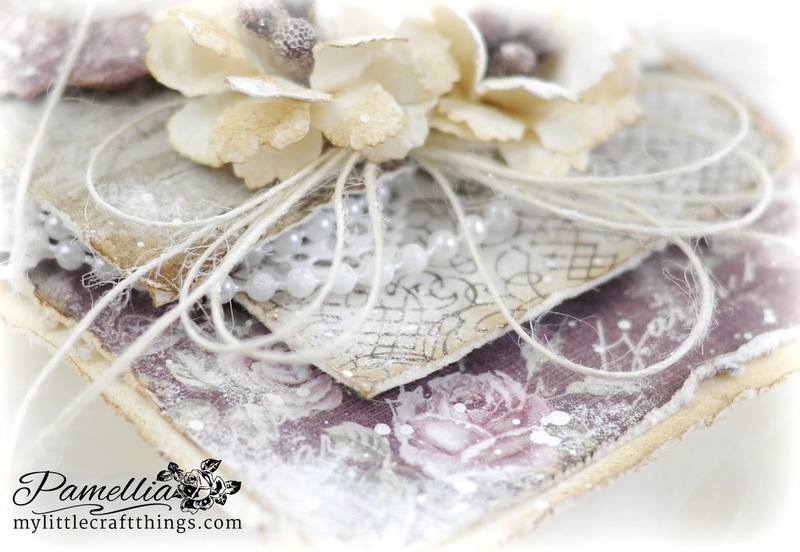 The Prima doily is one of my very favorites! Thanks for the inspiration, my friend... you never disappoint me!!!! This is such a gorgeous creation! I love the shabby chic color palette, the wonderful texture added by the string, the delicate flowers and all that lovely spatter! Mmmmm...mmmm...good! 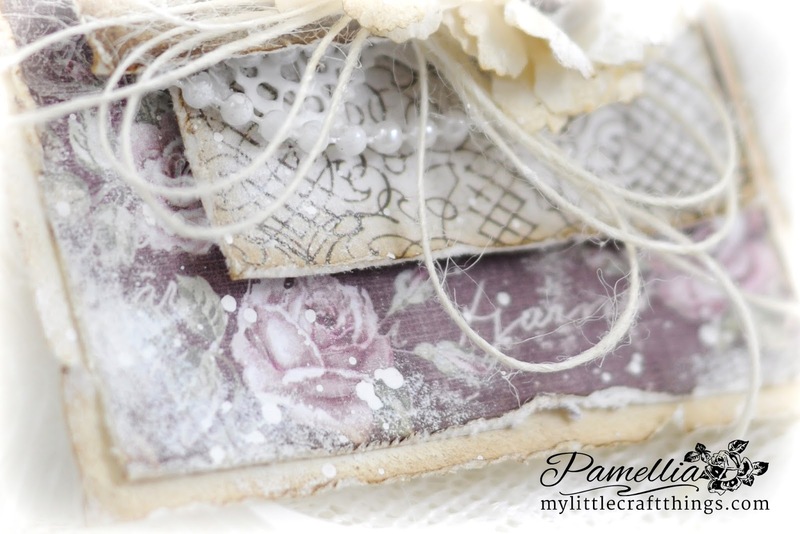 Just one LUSCIOUSLY LOVELY layer after another - you just build them so beautifully Pamellia. It's never to much, never too little - you somehow just always manage to get is just perfectly right. You definitely do Maja Designs proud dressing up their papers so WONDROUSLY. This tag is just GORGEOUS - it truly is. Your creepy spot on the hill gave me chill bumps - ugh.... glad you didn't go up yet! And that golden tree is so pretty - I'm glad it shines a path for you while you are out in the dark. That shoe made me giggle!!! Whew I bet there was a little one with cold toes! And your little family is just sooo fun. I so love seeing your handsome squildren. I must say - yours genetics are so much better than ours. Plain ole brown we are... not nearly as good looking - for sure. Heheheh!!! HAPPY VALENTINE'S DAY dear one. Hugs. j. Your squirrel always cracks me up!!! LOVE your girly tag...elegant and old world yummy! LOVE the layers and vintage femininity!!! Holy cow Bertha! Bubbles gone an done it now! This is elegant shabby chic with a touch of Rustic charm. You and twine go together like peanut butter and chocolate. Humdidly doowapwap wowzers! Fantabulous layers and tags and oh my-wood! Gloriously gorgeous and stunning! Stunning as always Pamellia, so many beautiful layers and details. This is absolutely stunning! It's such a beautiful shabby chic, vintage design with all of those layers and elements. Truly a work of art! Stunning creation Pamellia, I love how you have added not one but two tags. You have talented oozing through your veins! Stunning Tag card! Loved the words on your post and all the wonderful photos too! Thanks for the smile this beautiful Monday morning! Wow this is a stunning tag so much detail with all the layers and embellishments. Love the color combo and how you attached the button heart . This is so very beautiful! Tag upon gorgeous tag! Love the detail you put into every thing you do and the way you blend colors so subtly. Gorgeous project and congrats on your feature! A stunning tag Pamellia. You have packed so many gorgeous details into this and I love the papers and die-cuts you've used. The clever way you've attached the wooden heart draws the eyes straight to it. Wow! this is shabby chic at it's very best. I love every little detail on it. GORGEOUS tag! Fabulous colors, fantastic layering and wonderful textures! I love the centered heart and the details to your design are spectacular! Awesome pics~those little fur babies are so darn cute! My beautifully inspiring friend, your tag is true work of (he)art! I'm not surprised in the least that you use Maja papers unlike anyone...I wish you could teach me how to layer so stunningly. Alas, it is one of your crafty gifts that I will simply adore with great admiration. :o) This is shabby chic brilliance and I love every detail. The heart detailing is gorgeous and oh how I love the pearls. You are such an inspiration, Pamellia... and an even lovelier person! Amazing pictures to close out your post, too... I hope you realize how much joy to offer to all of your friends and visitors. :o) Big hugs! as the comment before this is a work of art, and so wonderfully created. You just continue to amaze me on how much wonderful work is crammed into such a small area. Such a very beautiful design as always. 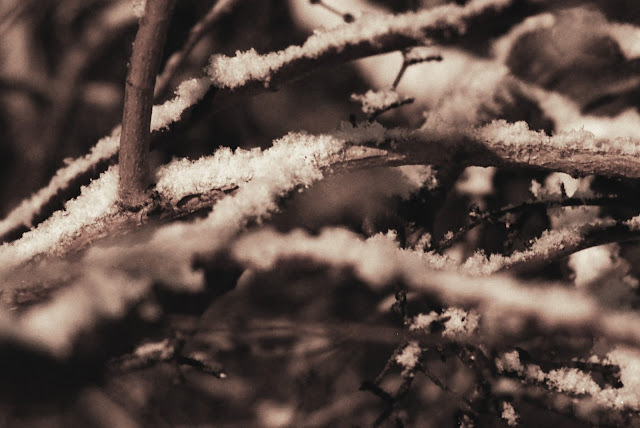 Love the photos, and my it has snowed there. Beautiful tag Pamellia! I really love the way you used the string on this one- you are too clever,my friend! Yikes for the shoe in the tree! That poor baby's cold foot!! Really beautiful tag with so many wonderful things to look at. Beautifully done! Beautiful tag, every layer having a little piece of loveliness. Always a joy to see your extended family too.